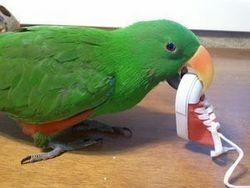 Foot toys are an essential part of your bird's daily routine. Remember... Busy feet are Happy feet! Paper fingers are a fabulous foot toy, shredding toy and toy part for making your own toys. Hide healthy, non-perishable treats inside to make this a great foraging toy! Stuffed paper fingers are a fabulous foot toy, shredding toy and toy part for making your own toys. Great for foraging. Loved by by little to big birds! These adorable "foot" toys are only 3" x 1". Not to wear... but to play with! NOTE: Our sneakers DO NOT contain the metal grommets which are on many of the sneaker toys on the market. Hide some nuts or Nutriberries inside and make this a foraging toy! Sadly, Scooter flew over the rainbow bridge on 2/27/18. He was 22 years old. All of us here at My Safe Bird Store will miss this little Icon. He sure was a special little guy. Video courtesy of Sonny, an Amazon parrot, and her dad, Ronen, in New York. Playtime is sure to be enriched when you offer this fun, distinctive bird toy. Planet Pleasures Tire Foot Toy Bundle contains three 1 inch woven foot toys. These are awesome! Use as a hanging toy for the little ones or a fun "game" foot toy for medium to large birds! Have a game of toss with your bird! I just love these! Recommended for x-small to small birds, such as lovebirds, budgies, parakeets, cockatiels, conures, caiques, ringnecks and similarly sized birds. A great foot toy or can also be used as a toy part. Colorful bolt holds a plastic wing nut or nut which will move up and down the bolt. Quantity is ONE PIECE 1 3/4" x 1 7/8"
Quantity is 3 Pieces 1 3/4" x 1 7/8"
A great foot toy or can also be used as a toy part. Three inch bolt holds a two inch plastic wing nut which will move up and down the bolt. Exciting foot toy for most birds. Beads shake around inside the wiffle ball as your bird plays with it. Strong leather adds texture. Recommended for medium to large birds such as greys, goffins, eclectus, mini macaws, cockatoos and other similarly sized birds. Bright colored acrylic rings are stacked all the way down the paper lollipop sticks. Topped off with an adorable butterfly pony bead this foot toy is sure to be a pleaser! Recommended for medium birds such as greys, eclectus, goffins and other similar size birds. Brightly colored neon rings for the smaller birds. Flower measures 1 1/2" wide with a slightly larger than 1/2" opening. Great for making that "mega parts" toy! Also makes for a fun foot toy! Great for toy making, or even as a foot toy or foraging toy. Insert pine nuts or seeds to make this even more interesting. 100% Natural. Approximately 5" long and 1/2" in diameter. Use for toy making, foraging, foot toys... be creative! Versatile toy! You can hang from the cage for the smaller guys or offer as a foot toy for larger birds. Made with cardboard tubing and pine wood slats held together with a plastic hand. Stuff with almonds , pine nuts or even safflower seeds to make this a fun foraging toy. Great toy for most birds from small birds, such as Lovebirds, Budgies, Cockatiels and Conures to less aggressive medium birds, such as Eclectus, Greys, Goffins, and similarly sized birds! Adorable! The ultimate FOOT toy! A hefty chunk of coconut and two corn cobs are sandwiched in between two wooden feet! This toy is fastened with colorful bird-safe rope. Great as a hanging toy for small birds, and recommended as a cool foot toy for medium to less destructive larger birds, from greys, goffins, galahs, eclectus and similarly sized birds to macaws and cockatoos. Approxixmately 6" in lenghth. You receive two. 4-1/2"x4-1/2" 3" colored sturdy rubber colored intertwining bouncing ball with 12 22mm pacific beads. TOP SELLING TOY. Great foot toy for larger birds. A great foot toy or can also be used as a toy part. Three inch bolt holds a two inch plastic wing nut which will move up and down the bolt. Comes in a pack of three. Your Parrot gets double the fun with our individual KrittyTreats as it`s not only a toy... it`s a treat as well! Each hollowed wooden ring has been stuffed full of delicious seeds for your Parrot to enjoy. When they have finished the tasty centre they then have a new toy to chew. Playtime is sure to be enriched when you offer this fun, distinctive bird toy. Planet Pleasures Cylinder Woven Foot Toy Bundle is a three-pack of 2 3/4"x1" woven foot toys. These are awesome! Use as a hanging toy for the little ones or a fun "game" foot toy for medium to large birds! Have a game of toss with your bird! I just love these! Recommended for small birds, such as sun conures, caiques, pionus, hahns macaws and similarly sized birds. Adorable foot toy that makes lots of noise! Inside both outer balls is another ball for lots of clatter! Great for Caiques, Conures, Pionus and less destructive medium birds such as Eclectus, Greys, Goffins and similarly sized birds. NOT recommended for birds with a beak strength to break the plastic. Made using all natural products these small woven square foot toys have been skilfully hand woven with your bird in mind. Interesting woven patterns and assorted colours are designed to appeal to your bird and more importantly to keep their beaks and minds entertained, as each of the different styled weaves present your Parrot with a new chewing challenge. A colored 3 cm rattan ball attached to a popsicle stick. Fill it with crinkle paper or almonds. Great for foraging! Popsicle stick detaches from ball and is not glued. 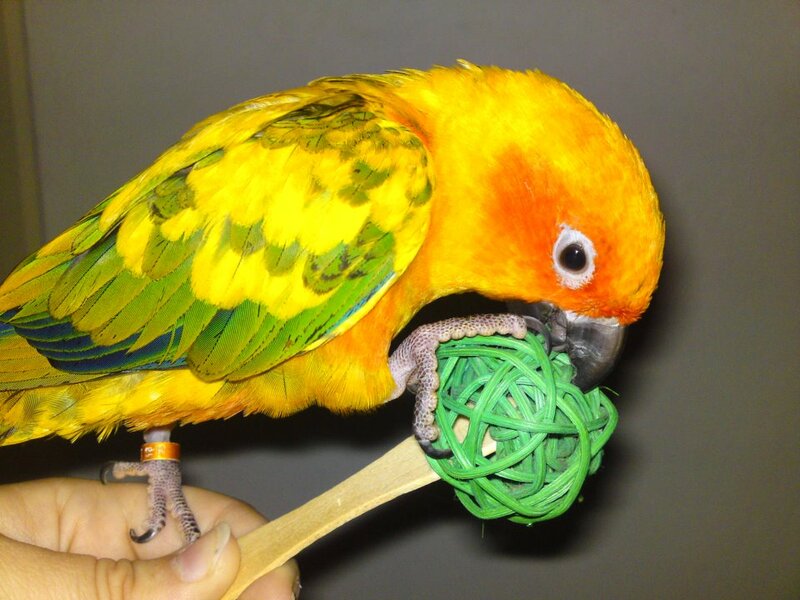 Photo courtesy of Sunny, a Sun Conure, and his mom, Polona, from Slovenia! Wooden barbell with two plastic triangles. Great for conures to pionus. Approx. 3" long. Vinyl assortment of characters - great for small to medium birds. An absolutely favorite for Parrotlets, but let your Caique give one a go! Bagel Chunk Small 3" x 2" x 5/8"
Bagel Chunk Large 4" x 2" x 5/8"
Wooden barbell with two plastic triangles. Great for medium to larger birds. Approx. 4" long.